To see them all please visit the "Created with Free Software" page of the FSFE. Please make use of this stamp whereever you see fits. If you have photos or screenshots of the button in action please comment here. 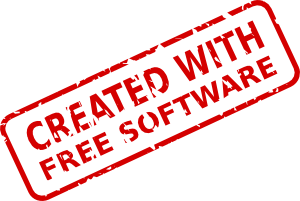 Please join promoting Free Software! [EDIT] : The button sources (SVG) are licensed under the Creative Commons Attribution-Share Alike 3.0 license (unlike this blog post itself, see box below). The PNG versions are licensed even more liberally under the Creative Commons Zero 1.0 Universal license. The idea is to keep derivatives "in the pool" while allowing to use the PNGs without even attribution.